We always say that the power supply is the heart of the computer, since the other components depend on it. A safe and powerful PSU is essential, and if it has a modular management system for cables and good efficiency, much better. This is the case of the Thermaltake ToughPower Gold 750W, which we will talk about today. It is one of the most powerful models Thermaltake has created in recent years. This PSU offers, as its name implies, 750W of power and boasts an 80Plus Gold certification, which ensures at least 87% efficiency. In addition, it has every possible protection (against overloads, short circuits, etc). It features a semi modular design with flat cables to facilitate mounting even in cases that are difficult to access. As stated in the manufacturer’s website. This PSU has ATX standard dimensions and is capable of providing 750W (900W peak). The manufacturer does not tell us much, so we’ll see them on the other side. This source has a single 12V rail that can provide up to 64A of current, which together with its 4 PCI-Express 6+2-pin connectors ensures compatibility with multiple graphics cards. As for the wires, which as we have said all are flat, it has the following: 1 ATX 20+4-pin connector, 1 4+4-pin EPS, 4 PCI-Express 6+2-pin, 12 SATA, 4 MOLEX and 1 Floppy. As for power connectors , this source must be able to function virtually with any high-end system without problems. The Thermaltake ThoughPower Gold 750W is packed in a sturdy black cardboard box with a picture of the device as well as the logos of the certifications. On the back, we can find three charts: power, connectors, and efficiency. 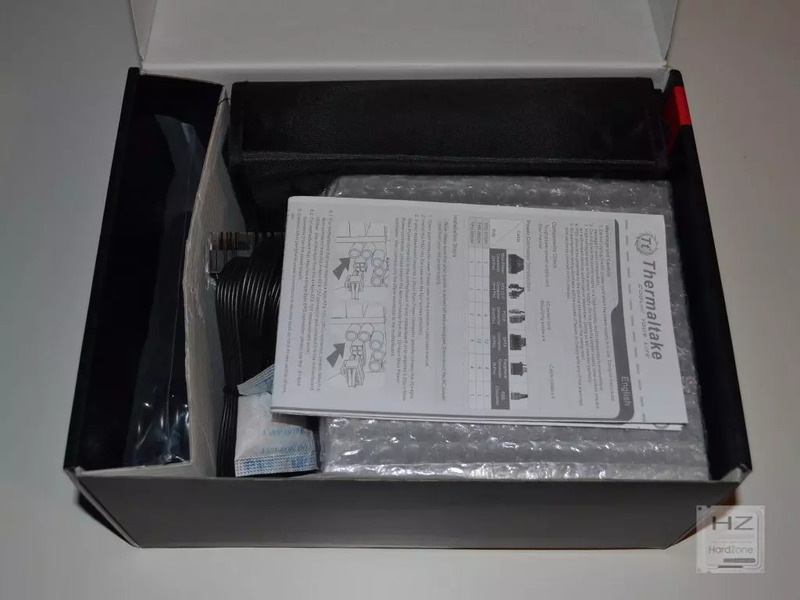 Inside the box, we find the PSU well protected by bubble wrap, a bag of modular cables, the instruction manual, warranty information, the power cord, screws and flanges. Inside the bag have modular cables protected by a plastic bag. Below you can see all the modular cables (remember that the source is semi modular, so the ATX and EPS cables are permanently anchored to the PSU). And here’s the device. As you can see, at the bottom is the air intake that is done through a silent 140mm fan. The sides show a sticker showing the brand and model of the PSU, and the power table and all certifications and protections are in the bottom. You can also notice that the modular connectors are located on the inner face of the source, and these are clearly identified with various colored label that describe their functions. Two wires coming anchored to the source, the ATX and EPS, as you can see both are also flat. Its length is enough to install this PSU even on the biggest cases. This time we have the source installed directly in our system to test it. The theoretical consumption of our system is about 550W, so a 750W source should be more than enough. It’s important to note that that we are using an overclocked processor with a TDP of 125W, which at 4.4 Ghz reaches approximately 160W. We also added one of the most powerful graphic cards on the market right now, the AMD 290x R9. Before we show you the results of our tests, will borrow the official data of the 80Plus certification to show you some of its features. As you can see, the ToughPower Gold is extremely stable, and except for the +12 V rail which is a bit low, its values are almost perfect. The Thermaltake ToughPower Gold 750W has demonstrated to be a power supply that delivers good quality and very stable performance voltages, even if you have a high-end system (or at least a high-consumption one). The flat cables and semi modular construction also make it very easy to install. Although the ATX and EPS cables are anchored to the source, they are also flat. You already know that the most complicated to install is the 24-pin ATX due to its thickness, and in the case of this ToughPower Gold we had no issue of any kind. Its price: This 750W model costs around 105 Euros, which we believe is a pretty good price considering all it offers. Flat Cables, including the ATX and EPS. Capable of powering multiple graphics cards. Being 100 % modular would’ve made it much better.